There is a belief among many Hindus that making certain specific offerings to Goddess Lakshmi on Friday will help in becoming wealthy. It is already predicted in the Puranas, that money will be the driving force in Kali Yuga – the present age as per Hinduism. Here are the offerings that one should make on Friday to get the blessings of Goddess Lakshmi and become rich. 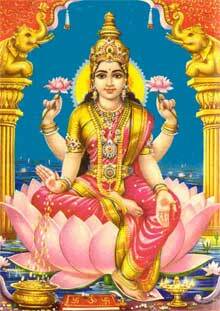 Offering flowers on Friday to Goddess Lakshmi is meritorious. The flowers, which have a good smell, should be offered to the Goddess. Feed a cow with green grass on the day. Offering water to birds and animals earns the blessings of Maa Lakshmi. Offer Jasmine perfume (attar or ittir) to the Goddess. It is said that when this is done with unwavering devotion even the poorest of the poor will become rich. Offering Chandan on Friday will help in attaining prosperity. Offering perfume and rose water to Goddess in a temple on the Friday that falls during Shukla Paksha (waxing phase of moon) in a Hindu month will help in solving all financial problems. Offer attar to Goddess while chanting Sri Suktam is highly meritorious. This attar should be used by the person while going out on job or business. Always keep the house neat and clean. Stop talking ill about others and stop gossiping. Use that time in chanting the name of Goddess Lakshmi or reading scriptures. A portion of money earned should be wisely invested; a portion of it should given in charity; a portion of it should be used for selfmaintence. The wealth received with the blessing of Goddess Lakshmi should be used wisely. When wealth is squandered and used for Adharmic purposes, she will abandon the place.